The Chinese calendar dates back to the Yellow Emperor and uses the Stem-Branch system to count the days, months and years. There are 10 Stems and 12 Branches in this system. Stems are named by the Yin-Yang and Five Elements (Wood, Fire, Earth, Metal and Water). Branches use animal names and the sequence is Rat, Cow, Tiger, Rabbit, Dragon, Snake, Horse, Goat, Monkey, Chicken, Dog and Pig. Stem and Branch are used together to form a cycle of 60 counting systems which begin with Wooden Rat and ends with Water Pig. Corresponding to renewal, growth and balance, Wood is a perfect compliment to the zodiac Goat, which contains Fire, Earth and also some Wood. Fire creates Earth, Earth produces Wood, Wood feeds Fire. This dynamic process can be seen as a simplified version or subset of the Wu Xing or Five Element cycle (also an aspect of Traditional Chinese medicine). 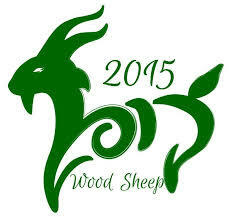 So, while the Year of the Goat is far from sedate, there are a number of stabilising factors. We have time to stop and smell the flowers along the way. The Goat likes to play and explore the world with bright-eyed wonder. This sign invites you to nurture your inner child and cultivate the things that make you feel happy and fulfilled. To see what the year of the goat holds for your own Chinese animal sign see here (NOTE: this website is for reference and I do not endorse its views or recommend its products). Acupuncture Awareness Week, supported by the British Acupuncture Council (BAcC), aims to help better inform people about the ancient practice of traditional acupuncture. With 2.3 million acupuncture treatments carried out each year, acupuncture is one of the most popular complementary therapies practised in the UK today. Yet many people only discover acupuncture as a last resort despite its widely recognised health benefits. Laura is a member of the BAcC. An exciting new area of research is the effect of acupuncture in modulating certain biomarkers. It is increasingly understood in conventional medicine that a small number of biochemical mechanisms, like low-level chronic inflammation, underly a very wide number of chronic diseases, from type 2 diabetes to depression to cardiovascular disease to cancer. This large and growing body of research on acupuncture’s beneficial effects on various fundamental biomarkers helps to explain why it is successfully used for such a wide-variety of clinical conditions. 3 McDonald et al (2013). The Anti-Inflammatory Effects of Acupuncture and Their Relevance to Allergic Rhinitis: A Narrative Review and Proposed Model. Evidence-Based Complementary and Alternative Medicine, 2013(4), 1–12. In the 2014 Summer newsletter I described dantian breathing or taking qi to dantian. 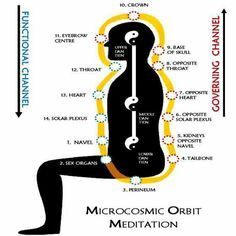 After practicing qigong or taiji for a while, the qi becomes strong enough to go through the front (Ren) channel and the back (Du) channel to form a circle or xiao zhou tien or microcosmic orbit. In Daoist philosophy, man is a connecting heaven and earth through this breathing.